The stadium played host to the 1940 and 1942 NFL championship games. The 1940 game was the stunning 73-0 win by the Chicago Bears, the largest shutout game in the history of the National Football League. 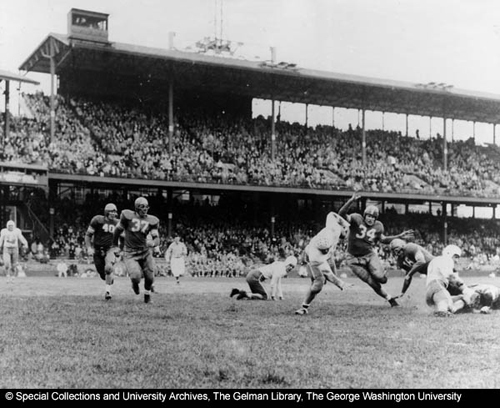 The 1942 game was essentially a rematch, and this time the 'Skins upset the undefeated Bears, 14-6. According to Richard Whittingham's history of the Chicago Bears (ISBN 0671628852), 'Skins owner George Preston Marshall's pregame "pep talk" to his team consisted solely of Marshall writing "73-0" on the chalkboard. During a December 7, 1941, Redskins game against the Philadelphia Eagles, an announcement came over the public-address speakers informing all generals and admirals to report to their duty stations. The bombing of Pearl Harbor was not explicitly announced over the PA system, leaving the thousands in attendance among the last Americans to learn of the attacks. The Redskins won that final game of the 1941 season by a score of 20-14, and finished with a record of 6-5, third in the NFL East.